A lightweight, powerful lantern is one of the most useful tools to have while camping. The best lanterns for camping provide a substantial amount of light while using very little energy. They are useful because campers do not have to hold them, like a flashlight or a headlamp. Camping lanterns can be hung up on trees, used in a tent, or taking for a walk. Many of them are also good options to have in case of power outages at home. 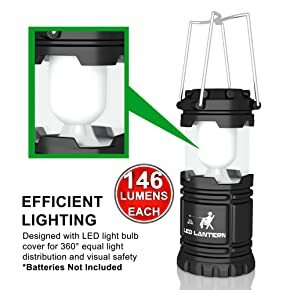 The best part about using a camping lantern is that everyone in the campsite can get by with one source of light rather than using several flashlights. 5.1 1. What are lumens? 5.2 2. Is it better to hang a lantern from the top or bottom? 5.3 3. Do I need a lantern if I have flashlights or headlamps? While shopping for the best lantern for camping, there are several features to be aware of. There are actually three types of lanterns that can be used for camping. Lanterns are made to fit the needs of people who use them for emergencies, for camping, and for backcountry hiking. The differences between the three types of lanterns comes down to weight and power. Emergency lanterns often use less battery power than a camping light, since many people have access to more batteries while they are camping. Backcountry lanterns are known for being lightweight and especially durable. They also use very little power, because batteries are not easy to come by out in the wild. When considering the best camping lantern it is important to look into the light that the lantern emits. There is no reason to use a lantern that only provides dim light because it will not be useful. And, it can be awkward to use a light that is overpowering in its brightness. No one wants the light at their campsite to be so bright that they cannot appreciate the night sky. But, the light needs to be bright enough so that people can perform tasks after the sun goes down. Some of the most popular styles of lanterns provide adjustable light settings. Another factor to consider regarding light is how the light is emitted from the lantern. Many camping lanterns have lampshades to direct the light down, rather than in people’s faces. Some have plastic that is tinted or slightly opaque to provide a dimmed working light. Lanterns should not have lights that point in specific directions; they should have lights that cast an overall glow. If you want a light to point, it is better to use a flashlight. There are also several features that campers appreciate with their lanterns. One feature that campers appreciate is that lanterns can be hung up. In many campsites and especially while backpacking, lanterns can be hung from low hanging branches. Many tents today have hooks in at the highest point so lanterns can be hung from them. However, if your campground does not have many trees, you will want to be sure your lantern has a solid, non-slip base. Some have adjustable legs, like camera tripods, so they can be placed on uneven surfaces like rocks. Along with sturdy bases and hanging hooks, lanterns that use little to no battery power are highly desirable. There are lanterns that use small solar panels to charge during the day, so they can be used at night. These types of lanterns do not give off as bright a light as those with batteries do, but they are much less expensive to operate. There are also lanterns that serve several functions and include charging ports for small electronics. Some even have small radios built into them. There are also little lanterns that can be used in small tents; they can be useful for quick walks to the bathroom or to read at night. Another factor that is valuable to hikers and campers is the number of features and their versatility. Of course, lanterns need to have on-off switches, but the better lanterns have more than that. Some lanterns will charge smartphones. Others have dimming capabilities or strong hooks that allow them to hand safely. Some lanterns are waterproof and weatherproof, too. Some also float. Lanterns that can multitask are highly desirable. Finally, durability is a necessity when using a camping lantern. The best camping lantern reviews will discuss the durability of the housing, the light, and the battery life. Today’s lanterns are made of plastic, but they have rubber and metal to help with the durability. It is important that lanterns can handle falls from the roof of a tent. It is also important that they can withstand a rainstorm or even a strong cold wind. 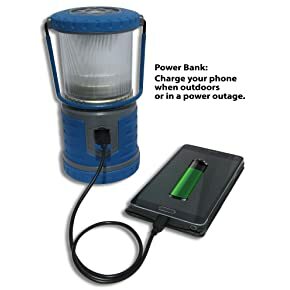 Durability also includes power, so if a lantern only lasts a short time with several batteries, it is not a reliable or durable product. One of the most durable types of lanterns is the solar charging variety. One of the brightest, durable, and most affordable lantern available today is the Divine LED lantern. This light is one of the easiest to use. As soon as you take it out of the box, you simply load it with batteries and turn it on. The Divine LED is made of water-resistant materials that are military grade, even the plastic. It is designed to be used both inside and outside. 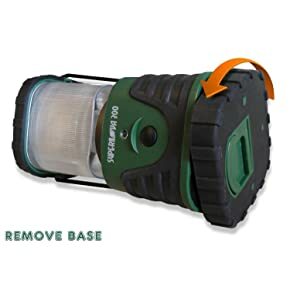 This lightweight lantern uses very little battery power, so you can use it for several nights while camping without having to reload batteries. One of the best features about this lantern is that is collapsible, making it easy to carry in a backpack or load into a car. The light is so powerful without draining the batteries because it is made of little individual LED lights that work together. To save money on batteries, the lantern does work with rechargeable batteries, too. This little light casts a serious amount of light in a full circle. The lantern is made of military grade materials, too. This small lantern collapses so it is easy to pack. It uses AA batteries and the LED bulbs will last for 100,000 before the bulbs need to be replaced. One of the most unusual features of this lantern is that it actually includes a guide for making smores – which fits with the brand name MalloMe. The light can be used for any type of emergency that requires lights. It is a great choice to keep in a car or to use as a booklight. The lamp comes with a 100% satisfaction guarantee – most camping equipment does not. This light is water resistant. The lamp is all of five inches tall and it has an opaque covering to keep the light from being too bright. This Etekcity lantern is one of the most popular with campers and hikers because of its extremely bright LED lights and durability. The lantern is lightweight and will only use one set of batteries for up to 12 hours. The lantern is fully collapsible, so you can easily pack it up for a backpacking trip. 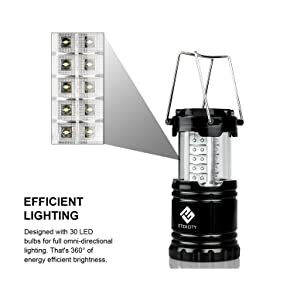 The lantern includes 30 small LED bulbs that create a bold and bright light that can be used while camping or during emergencies around the house. It uses military-grade materials to be durable and reliable, even in poor weather conditions. The lantern comes with a 10-year warranty from the manufacturer. It also includes fold-away handles that make it useful when you have to move at the campsite or around the house. The lantern is so lightweight that is a good choice to take trick-or-treating, too. The Supernova light speaks for itself. The lantern is one of the brightest available and it can be purchased in even higher levels of lumens. With 300 lumens of light, it can easily light up a campsite or a room in your home. The LED light is efficient and can actually be used for six days. The individual LED lights have a guaranteed lifespan of 100,000 hours. If there is an emergency, the LED indicator light will pulse slowly so you can find it in your home or in your tent in the dark. It is made of rubber and plastic; these materials make the light durable and resistant to water. The lantern uses convex reflectors to spread the light widely. The lantern also has a removable top if you need to direct the light in a specific direction. 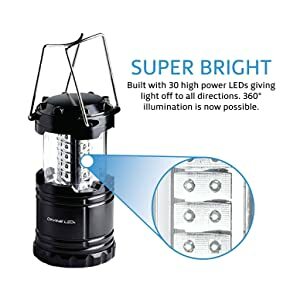 When you need a high-quality camping lantern that has several options for the brightness of the light you need. The lantern features white LED lights as well as red LED lights. The white lights are for regular vision, but the red LED is so you can still see in the darkness. You do not have to wait for your eyes to readjust if you use the red LED light. 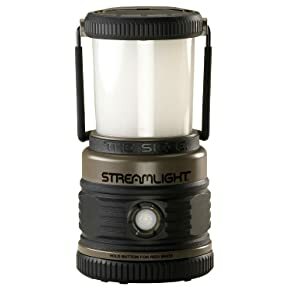 The Streamlight Lantern has an ergonomic design that lets you position the handle upright or put away. It is also really easy to hang the light because it has D-rings on the top and the bottom. The LED lights are low-power lights so battery life could last over 290 hours. This lantern does have five settings: high, medium, low, red low, and red flashing. It uses D batteries. This unique lantern is square, rather than round. The light panels on each side will snap on and off to be used as small individual lights. Then, they can be reattached to the lantern for one bright light with 360 degrees of power. The lights actually recharge while they are on the base from the 8 D-cell batteries that fit inside of it. The lantern will run for 75 hours and the individual panels will run for 90 minutes. The lantern does run cool, so there is no worry about burning your hands on this gear. Each of the snap off panels has its own on-off switch to preserve battery life. The whole lantern also has an on-off switch, too. When all four panels are attached, the full light will reach 26 feet. Coleman includes a five-year limited warranty. The Tough Light lives up to its name. This lantern does not require batteries; it will charge with a USB, just like a smartphone. The lantern is designed to provide up to 50,000 hours of use with the LED lights. The lantern can be charged in a car, using the 12-volt DC charger. And, the lantern comes with two charging cords. Along with being charged by a USB cable, the lantern will charge other electronics like smartphones and cameras. The Tough Light uses a Li-ion battery and if it is not used, it will stay charged for 9 months. The lantern is water-resistant and made of military grade plastic and rubber. It includes O-rings to protect the inside pieces and the product can actually outlast a five-foot drop. Tough Light includes a two-year warranty. This is the measurement used to determine the brightness of the emitted light. The higher the number, the brighter the light. 2. Is it better to hang a lantern from the top or bottom? It all depends on the placement of the D-rings. In most cases, it should not matter. But, if the manufacturers put a D-ring on one side, then that is the best side for that lantern. Many will have D-rings on the top and bottom – so both sides have benefits. 3. Do I need a lantern if I have flashlights or headlamps? Yes. Even if you only have on lantern, you will find that they are easier to use because they do not blind the people who are near the light. Think of what happens when you shine a flashlight directly at someone; that doesn’t happen when you use a lantern around other people. A lantern provides good all-around light for an entire campsite. When it comes to choosing the best lantern, the Streamlight is the best one. The best thing about this light is the fact that it comes with so many lighting levels. It is important to understand that the brightest light is not necessary for every moment of camping. 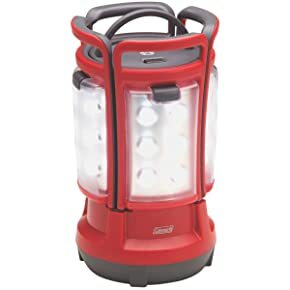 The fact that this light comes with the red option is useful, especially for campers who have to take late night trips to the restroom. It is a moderately priced camping lantern and it does not require large amounts of batteries – making it affordable run after purchasing it. The best lantern for camping is water-resistant and it can survive a two-meter drop, too. I really like to camp with the family. Having a good lantern is one of the best purchases that you can make. After the bonfire goes out, you have to be able to see, right? They also work great in a screen tent where everyone gathers for meals as the Streamlight 44931 provides plenty of light. Plus it has great reviews!